Decrepitation is usually extremely intense, but at unusually high temperatures given the typically low formation temperature of calcite. This sample is from the Bou Jaber mine in Tunisia, a small, limestone hosted karst breccia with Pb, Zn, F and Ba mineralization. Fluid inclusion homogenization data in barite and fluorite indicate a formation temperature of 90-120 C from hydrocarbon rich source fluids. 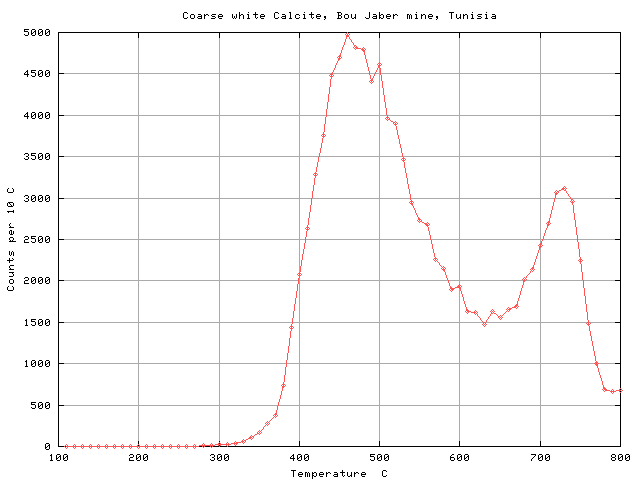 Calcite and other carbonates have decrepitation peaks ranging from 400 to 800 C which do not reflect formation temperature.